We love our fireplaces. In addition to being the centerpieces of ambiance in our homes, they warm our toes and our hearts too. But remember that one of their central functions is to produce fire and heat, so safety is of utmost importance. We love our gas fireplaces. In addition to being centerpieces of ambiance, they warm our toes and our hearts too. But it’s important to remember that one of their central functions is to produce heat with fire, so safety is of utmost importance. All gas fireplaces should have a protective screen over the glass. Screens reduce risks of serious burns by creating a barrier that prevents skin from coming into direct contact with the hot glass. Keep in mind, however, that screens can also retain heat, so touching them isn’t advised. 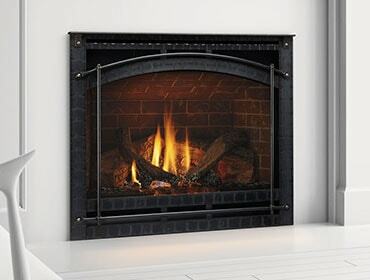 All of our Heatilator gas fireplaces, and inserts are outfitted with factory-provided protective safety screens. When choosing a gas fireplace, opt for a direct vented model. They have sealed combustion systems protect indoor air quality by drawing air from outside the home for the fire, while expelling 100 percent of combustion exhaust and by-products outside the home. A video explaining direct vent technology is available here.